Sussex boss Mark Robinson believes recent signing Danny Briggs has a key role to play as the club look to rebuild following their relegation. The left-arm spinner, 24, was signed from Hampshire last week. "As disappointing as relegation is, it allows you to reset and realign," Robinson told BBC Sussex. "Going down really makes you focus. We've got a young left-arm spinner who fits the brief for what we're looking to do." He added: "If the right player is available - and we definitely feel Danny is and that he's the right age - then we'll make those moves." 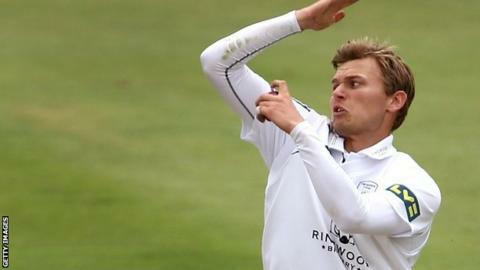 Briggs, who was released early from his Hampshire contract, has taken 191 first-class wickets in 67 matches, with a best of 6-45, which he took for England Lions in 2011. He made his England one-day international debut against Pakistan in Dubai in 2012, and has also played seven times for his country in the T20 format. "He's only 24 - the perfect age to improve and get better," said Robinson. "He's got to be hungry, because he's left his contract and negotiated a contract that isn't as favourable to try to further his career, which is a sign of intent. "He's put monetary interests to one side to try to get his career on track in all formats. "His hunger has been demonstrated by taking a risk by leaving a club where he was established and safe to move somewhere else with a view to moving his game on."